The Chatillon DFE series digital force gauge marks a new era in force measurement. This compact, easy to use force gauge is designed for economy applications without compromising functionality. The Chatillon DFE digital force gauge is ideal for both hand held and test stand applications. The DFE gauge is available in capacities from 2 pounds (10 N) to 500 pounds (2500 N). The DFE features an integral loadcell with a measurement accuracy of better than 0.25% full scale. A large, easy to read, high resolution dot matrix LCD display supports a variety of standard gauge functions, including normal and peak readings, high / low limits, setpoints, pass / fail results, statistical results, loadcell actuation and direction. Loads are displayed in oz, g, lb, kg and N units. The display can be inverted and displayed results may be "hidden" from the operator. 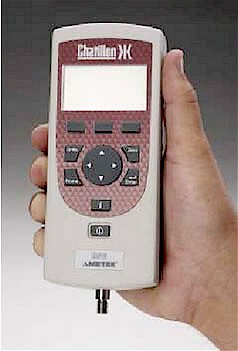 The Chatillon DFE digital force gauge may be specified with or without RS232 serial communication. All DFE gauges come with a carrying case, adapter / charger, testing accessories and NIST Certificate of Calibration with data. The new Chatillon DFS series force gauges deliver more features without compromising easy of use, accuracy and, very importantly, costs to you. You'll do more with a Chatillon DFS series gauge and you'll get the reliability and quality that you've come to expect from Chatillon force measurement instruments. A large, easy to read dot matrix display can display up to eight lines of information. The high resolution display features contrast adjustments and can be inverted when required. The display can even be "hidden" at the press of a button. A load bargraph indicated load direction, measured load and safe load and helps to prevent overloads. The integral loadcells feature mechanical overload protection of 150% full scale. The rubber keypad features dedicated and dynamic function keys. The function keys correspond to displayed options and guide the user during operation. A navigation pod lets you navigate through the menus and to scroll and change values quickly. The innovative i key can be used to display critical information on the gauge such as gauge capacity and resolution, battery life, loadcell overload history, even service information including last calibration date or the location of service centers. The DFS force gauge features RS-232 and Mitutoyo Digimatic digital outputs. the gauge also features a ±2Vdc analog output. Measured values may be transmitted to an external device using a manual command at the gauge, or a measured value may be transmitted based on an an externally driven command, e.g. from a personal computer or other serially interfaced device.